I asked Fr. 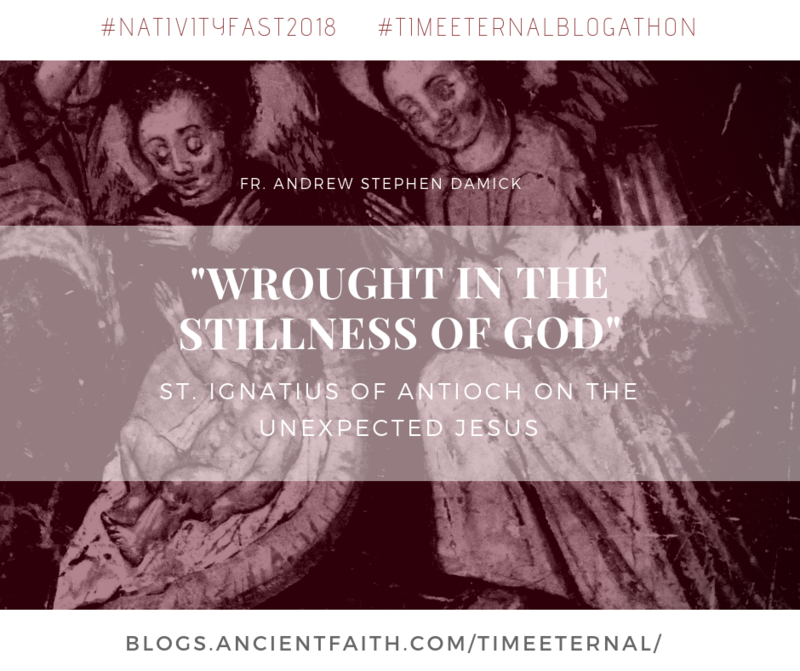 Andrew Stephen Damick to stop by the Time Eternal blogathon and share something with us about St. Ignatius. Why? Because today (December 20) is St. Ignatius’ feast day–AND because Fr. Andrew’s most recent book is about him, and because I wanted to know what St. Ignatius had to say about the birth of Christ. Why not kill three birds with one stone? Anyway, thanks for joining us, Fr. Andrew! Five days before Christmas, the Orthodox Church begins the final preparatory period that is called the Forefeast of the Nativity, and there is an intensification of attending hymnography sung to mark these days. On the day that the forefeast begins, December 20, the Church celebrates a shining saint from its earliest years, Ignatius of Antioch, the third bishop of that city and a disciple of the Apostle John the Evangelist himself. It is also traditionally held that Ignatius met the Lord Jesus when he was a child, identified as the child Jesus took into the midst of His disciples in Matthew 18:1-4. The extant writings of this early martyr († ca. 107) all come from the time of his journey from Antioch to Rome to be eaten by wild beasts in the Colosseum. They are seven letters written to various churches he knew or whose representatives journeyed to meet him along the way, including the great Polycarp of Smyrna, another disciple of John and Ignatius’s friend. Both the Virginity of Mary and her giving birth escaped the notice of the prince of this age, as did the Lord’s death — three mysteries of a cry, wrought in the stillness of God. How then was he made manifest to the ages? A star shone forth in heaven brighter than all the stars, and its light was ineffable and its novelty produced astonishment; all the other stars, with sun and moon, gathered in chorus about this star, and it outshone them all [cf. Wisd. 7:29,30; 18:14,15]. There was perplexity as to the origin of this novelty, so unlike the others. Thus all magic was dissolved and every bond of wickedness [cf. Isa. 58:6] vanished; ignorance was abolished and the old kingdom was destroyed, since God was becoming manifest in human form for the newness of eternal life [cf. Rom. 6:4]; what had been prepared by God [cf. 1 Cor. 2:9] had its beginning. Hence everything was shaken together, for the abolition of death was being planned. Why did he not see what was happening in the Bethlehem cave? He wasn’t looking. But it is not as if he should not have noticed. After all, “a star shone forth in heaven brighter than all the stars, and its light was ineffable and its novelty produced astonishment; all the other stars, with sun and moon, gathered in chorus about this star, and it outshone them all.” This sign drew the Magi, and it has become for us Christians a sigil and a beacon that lights our dark nights and indicates for us the way. The Lord Himself moves into time and through time, yet hidden from those who will not “notice,” even though its light is plain for those who will look. Yet we do not know where it comes from: “There was perplexity as to the origin of this novelty, so unlike the others.” The coming of God in the flesh, through a virginal conception and a humble birth, is perplexing, because it was unexpected. And indeed His second coming shall also be unexpected, as a thief in the night (cf. Matt. 24:36; I Thess. 5:2; 2 Peter 3:10; Rev. 3:3, 16:15). God is in the business of tricking the devil by His unexpected act of Incarnation. The devil was deluded by the illusions of his own expectations. It is not the Incarnation which is “magic” but rather that which it destroys, a distorting sorcery. Or rather, we could say that the “deep magic” (to use C. S. Lewis’s creative foundations for Narnia) undoes the sorcery which is of the devil, the sorcery that in wickedness binds man, the sorcery that binds us in ignorance, trapped in “the old kingdom.” It is the Incarnation, God “becoming manifest in human form for the newness of eternal life,” which undoes them all. And then finally Ignatius gives the final revelation of the unexpected coming of God: “Hence everything was shaken together, for the abolition of death was being planned.” It is all shaken, all upended, all demolished and abolished. The old order is ended in an earthquake, because it was an order based on death. And He has come to abolish it, to throw down death from his throne, to wreck that throne itself, to place His own throne in the heavens, where the kingdoms of this world become the kingdoms of our Lord and of His Christ (Rev. 11:15). It is appropriate that this proclamation of the retaking of this world by God should be preceded by an earthquake (Rev. 11:13). Ignatius’s telling of the Incarnation as “three mysteries of a cry, wrought in the stillness of God” — the Annunciation, the Nativity and the Passion — powerfully brings together the cosmic and public act of the Incarnation in time along with its hiddenness from those whose “notice” it escapes, particularly the devil. The Incarnation is both a prophesied, public action and also a hidden, unexpected one. Come, Thou long unexpected Jesus. The Very Rev. 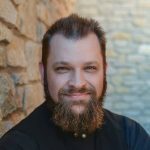 Archpriest Andrew Stephen Damick is pastor of St. Paul Orthodox Church of Emmaus, Pennsylvania, author of Bearing God: The Life and Works of St. Ignatius of Antioch, Orthodoxy and Heterodoxy, and An Introduction to God. 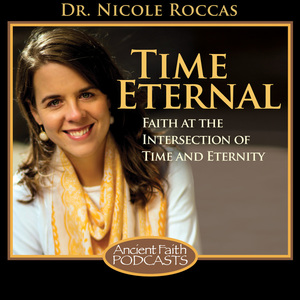 He is also host of the Orthodoxy and Heterodoxy and Roads from Emmaus podcasts on Ancient Faith Radio, co-host of The Areopagus podcast, and he is a frequent speaker at lectures and retreats both in parishes and in other settings. You can follow him on Facebook and Twitter.